Payment vouchers are a vital part of every business transaction for both the buyer and seller as they offer proof of both payments made and services rendered. No business should operate without issuing payment vouchers to other businesses or customers as they can provide a degree of protection for both the buyer and seller and act as a proof of payment to both parties. Using a payment voucher template is a great way to make the process of completing a voucher with each sale quick and easy. The Organization You Need: Our payment voucher sample contains all the fields you need to ensure detailed information about each transaction at your business. You can easily number each voucher to keep them organized and include detailed information about each transaction including whether you received funds for services or paid for services or products at your business. If you need to be sure every transaction at your business is approved, our template provides fields for your employees to enter who prepared the voucher and who approved it so you can easily track each and every voucher in your company. 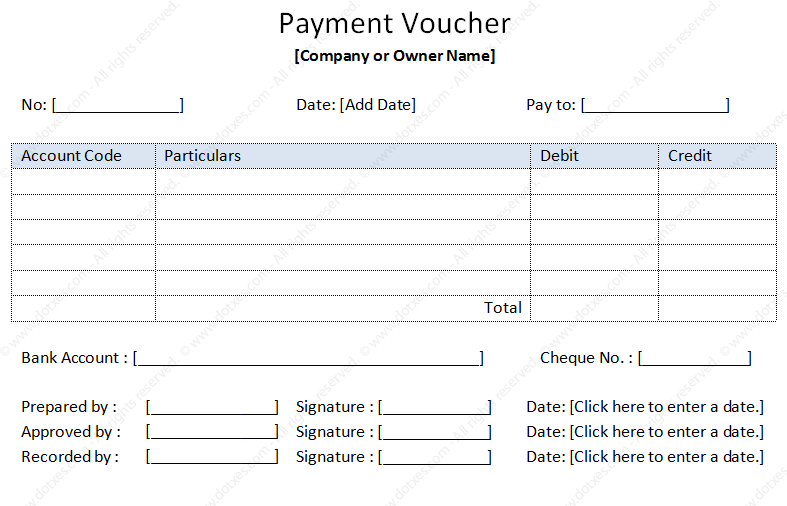 The payment voucher template is designed to look great and is the perfect addition to any business who seeks to be more organized and present a more professional image in all aspects of business. Template is easy to use and customize and are compatible with multiple versions of Microsoft Office®. No matter what business you are in, using payment vouchers are an absolute necessity. They help you track your spending and your revenue so you can easily track every cent that moves through your business. Our payment voucher template has been designed to meet the needs of all businesses and can greatly speed up the process of creating a voucher while also making each of your vouchers appear much more professional.